Apostolic Succession is transmitted in an episcopal consecration by the laying on of hands. Apostolic succession refers to the Christian practice of appointing bishops in lineages of uninterrupted lines that trace back to the original twelve apostles. 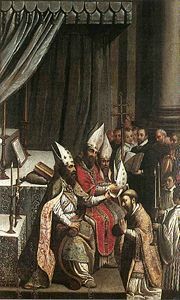 The transmission of apostolic succession occurs during episcopal consecrations (the ordination of bishops) by the "laying on of hands" from previously consecrated bishops. Generally, all pre-Protestant Reformation churches including the Roman Catholic, Eastern Orthodox, and Oriental Orthodox claim apostolic succession. The churches of the Anglican Communion also claim apostolic succession. While their claim is recognized by some Eastern Christian churches, it is not officially recognized by the Roman Catholic Church, based on Pope Leo XIII's papal bull Apostolicae Curae. However, since the promulgation of Apostolicae Curae, Anglican bishops have acquired Old Catholic lines of apostolic succession recognized by Rome. Due to the sacramental theology of these churches, only bishops and presbyters (priests) ordained by bishops in the apostolic succession can legitimately celebrate several of the other sacraments, including the Eucharist, reconciliation of penitents, confirmation and anointing of the sick. The Roman Catholic Church further asserts that Jesus Christ gave Saint Peter a unique primacy among the apostles, which has been passed on in the office of the Papacy. Eastern Orthodox theology and ecclesiology teaches that each bishop is equal to the other bishops, even the Ecumenical Patriarch, who is first amongst equals, continuing the ancient practice of the church, who considered the Roman Pontiff to be first but not superior to the rest of the bishops. According to the Bible, the original apostles were chosen directly by Jesus and witnessed the resurrected Christ. According to this understanding, the work of these twelve (and the Apostle Paul), together with the prophets of the twelve tribes of Israel, provide the doctrinal foundation for the whole church of subsequent history through the Scriptures of the Bible. Additionally, it is worth noting that others beside the twelve apostles and Saint Paul are called "apostles" in the New Testament. "Let them produce the original records of their churches; let them unfold the roll of their bishops, running down in due succession from the beginning in such a manner that [that first bishop of theirs] bishop shall be able to show for his ordainer and predecessor some one of the apostles or of apostolic men." Additionally, the Epistle of St. Clement to the Church at Corinth, written around 96 C.E., defends the authority and prerogatives of a group of "elders" or "bishops" in the Corinthian Church which had, apparently, been deposed and replaced by the congregation on its own initiative. In this context, Clement explicitly states that the apostles both appointed bishops as successors and had directed that these bishops should in turn appoint their own successors; given this, such leaders of the Church were not to be removed without cause and not in this way. Further, proponents of the necessity of the personal apostolic succession of bishops within the Church point to the universal practice of the undivided early Church (up to 431 C.E. ), from which, as organizations, the Catholic and Eastern Orthodox (at that point in time one Church until 1054 C.E. ), as well Oriental Orthodox and the Assyrian Churches have all directly descended. These churches hold that Christ entrusted the leadership of the community of believers, and the obligation to transmit and preserve the "deposit of faith" (the experience of Christ and his teachings contained in the doctrinal "tradition" handed down from the time of the apostles, the written portion of which is Scripture) to the apostles, and the apostles passed on this role by ordaining bishops after them. Roman Catholic, Orthodox theology additionally hold that the power and authority to confect the sacraments, or at least all of the sacraments aside from baptism and matrimony (the first of which may be administered by anyone, the second of which is administered by the couple to each other) is passed on only through the sacrament of Holy Orders, and an unbroken line of ordination of bishops to the apostles is necessary for the valid celebration of the sacraments today. Roman Catholics recognize the validity of the apostolic successions of the bishops, and therefore the rest of the clergy, of the Eastern Orthodox, Oriental Orthodox, Assyrian, Old Catholic, and some Independent Catholic Churches. Since 1896, Rome has not fully recognized all Anglican orders as valid. The Eastern Orthodox do not universally recognize Roman Catholics, Anglicans or any other group as having apostolic succession. Until the time comes when the practices of the Orthodox Church are unified, the validity of any priest's ordination will be decided by each autocephalous Orthodox Church. Neither the Roman Catholic nor the Orthodox Church recognize the validity of the apostolic succession of the clergy of the Protestant churches, in large measure because of their theology of the Eucharist. As a traditional ecclesiastical doctrine, apostolic succession provides an historical basis for the spiritual authority of the bishops of the Church (the episcopate). Apostolic succession is usually described as the official authority that has been passed down through unbroken lines of successive bishops beginning with the original Apostles selected by Jesus, or on a similar basis. Put another way, bishops (in churches subscribing to the doctrine) are only created bishops by other bishops; thus, every bishop today is the end of an unbroken line of bishops, extending all the way back to one (or more) of the Apostles, through which authority descends. This doctrine is claimed by the ancient Christian Churches (the Roman Catholic, the Eastern Orthodox, the Oriental Orthodox), and other ancient Churches, and as well as by the traditional Episcopal and other Anglican Churches, and by several of the Lutheran Churches; it is referenced favorably by other churches. Some Protestant churches do not accept this doctrine as it has been commonly described, but rather will redefine it in a different way. Papal primacy is an issue different though related to apostolic succession as described here. The Catholic Church has traditionally claimed a unique leadership role for the apostle Peter, believed to have been named by Jesus as leader of the apostles and as a focus of their unity, became the first Bishop of Rome, whose successors accordingly became the leaders of the worldwide Church as well. Churches not in communion with Rome do not agree completely or at all with this Catholic interpretation. The literature on this traditional doctrine is substantial. Many inferences from it may be drawn. Some Eastern Christians hold that the Roman church and, by extension, her Protestant offspring lost claim to apostolic succession by an illegitimate addition to the Nicene Creed (the Filioque clause) required by the Bishop of Rome just prior to the Great Schism in 1054 C.E. The rift resulted in the loss of apostolic succession in the western churches and the consequent doctrinal changes and excesses (e.g., Anselmian penal substitution, indulgences, etc. ), resulting in the Protestant Reformation and the further splintering of Western Christendom. The early Creed of the Church, adopted by the first ecumenical Council of Nicaea in 325, affirms that the Church is "One, Holy, Catholic, and Apostolic." However, Catholic in Greek "Catholicos" just means universal not referring to the Roman Catholic church but Christianity as a whole. Virtually all Christian denominations consider Apostolic Succession important in some fashion, although their definitions of the concept may vary, in some cases vary greatly. Churches that claim the historic episcopate include the Roman Catholic Church, Eastern Orthodox, Oriental Orthodox, Assyrian, Independent Catholic, the Anglican Communion, and several Lutheran Churches (see below). The former churches teach that apostolic succession is maintained through the consecration of their bishops in unbroken personal succession back to the apostles or at least to leaders from the apostolic era. The Anglican and some Lutheran Churches do not specifically teach this but exclusively practice episcopal ordination. These churches generally hold that Jesus Christ founded a community of believers and selected the apostles to serve, as a group, as the leadership of that community. In Roman Catholic theology, the doctrine of apostolic succession states that Christ gave the full sacramental authority of the church to the Twelve Apostles in the sacrament of Holy Orders, making them the first bishops. By conferring the fullness of the sacrament of Holy Orders on the apostles, they were given the authority to confer the sacrament of Holy Orders on others, thus consecrating more bishops in a direct lineage that can trace its origin back to the Twelve Apostles and Christ himself. This direct succession of bishops from the apostles to the present day bishops is referred to as apostolic succession. The Roman Catholic Church also holds that within the College of Apostles, Peter was picked out for the unique role of leadership and to serve as the source of unity among the apostles, a role among the bishops and within the church inherited by the pope as Peter's successor today. These churches hold that Christ entrusted the apostles with the leadership of the community of believers, and the obligation to transmit and preserve the "deposit of faith" (the experience of Christ and his teachings contained in the doctrinal "tradition" handed down from the time of the apostles and the written portion, which is Scripture). The apostles then passed on this office and authority by ordaining bishops to follow after them. Roman Catholic theology holds that the apostolic succession affects the power and authority to administer the sacraments except for baptism and matrimony. (Baptism may be administered by anyone and matrimony the couple to each other). Authority to so administer such sacraments is passed on only through the sacrament of Holy Orders, a rite by which a priest is ordained (ordination can be conferred only by a bishop). The bishop, of course, must be from an unbroken line of bishops stemming from the original apostles selected by Jesus Christ. Thus, apostolic succession is necessary for the valid celebration of the sacraments today. The unbrokenness of apostolic succession is also significant because of Jesus Christ's promise that the "gates of hell" would not prevail against the Church, and his promise that he himself would be with the apostles to "the end of the age". According to this interpretation, a complete disruption or end of apostolic succession would mean that these promises were not kept as would happen also with an apostolic succession that, while formally intact, completely abandoned the teachings of the Apostles and their immediate successors, as, for example, if all the bishops of the world agreed to abrogate the Nicene Creed or to repudiate the Bible. Roman Catholics recognize the validity of the apostolic successions of the bishops, and therefore the rest of the clergy, of the Eastern Orthodox, Oriental Orthodox, Assyrian, Old Catholic, and some Independent Catholic Churches. Rome does not fully recognize all Anglican orders as valid. This conflict stems over the Anglican Church's revision of its rite of ordination for its bishops during the sixteenth century. Most of today's Anglican bishops would trace their succession back through a bishop who was ordained with the revised form and thusly would be viewed as invalid. However, a few Anglican bishops in Europe today can claim a line of succession through bishops who had only been ordained through the old rite. These bishops are viewed as valid by Rome. This validity was achieved through a number of different means, including ordinations by the schismatic Catholic bishops of the Old Catholic and Independent Catholic Churches who converted to Anglicanism. While Eastern Orthodox sources often refer to the bishops as "successors of the apostles" under the influence of Scholastic theology, strict Orthodox ecclesiology and theology holds that all legitimate bishops are properly successors of Saint Peter. Eastern Orthodoxy thus makes a distinction between a geographical or historical succession and proper ontological or ecclesiological succession. Hence, the bishops of Rome and Antioch can be considered successors of Peter in an historical sense on account of Peter's presence in the early community. This does not imply that these bishops are more successors of Peter than all others in an ontological sense. Eastern Orthodoxy is less concerned with the question of 'validity' than Roman Catholicism, which means that Orthodox bishops can consider the merits of individual cases. It should be noted, however, that the Synod of the Russian Orthodox Church has specifically stated that Roman Catholic orders are recognized, to the effect that Roman Catholic clergy seeking admission in the Moscow Patriarchate are received without ordination at their existing rank. The historic and normative practice of Eastern Orthodoxy has been to reordain clergymen coming from the Anglican / Episcopal communion, thus indicating the non-recognition of Anglican orders. The Eastern Orthodox have often permitted non-Orthodox clergy to be rapidly ordained within Orthodoxy as a matter of pastoral necessity and economia. In some cases, priests entering Eastern Orthodoxy from Oriental Orthodoxy and Roman Catholicism have been received by "vesting" and have been allowed to function immediately within Orthodoxy as priests. Recognition of Roman Catholic orders is stipulated in 1997 by the Synod of the Russian Orthodox Church, but this position is not universal within the Eastern Orthodox communion. In addition to a line of historic transmission, Eastern Orthodox and Oriental Orthodox churches additionally require that a hierarch maintain Orthodox Church doctrine, which they hold to be that of the Apostles, as well as communion with other Orthodox bishops. The Armenian Apostolic Church, which is one of the Oriental Orthodox churches, recognizes Roman Catholic episcopal consecrations without qualification (and that recognition is reciprocated). The churches of the Anglican Communion claim to possess valid apostolic succession. When the Church of England broke from the Roman Catholic Church in the 16th century, it retained the episcopal polity and apostolic succession of the Roman Church. At first the Church of England continued to adhere to the doctrinal and liturgical norms of the Roman Church. However, in the years following the split, the Church of England was increasingly influenced by the protestant theology popular on the continent. During the reign of King Edward VI, changes were made to the rite of episcopal consecration. These changes became the grounds on which Pope Leo XIII, in his 1896 bull Apostolicae Curae, ruled that the Church of England had lost its valid apostolic succession due to the changes in the Edwardian ordinal. However, since the 1930s Old Catholic bishops (whom Rome recognizes as valid) have acted as co-consecrators in the ordination of Anglican bishops. By 1969, all Anglican bishops had acquired Old Catholic lines of apostolic succession fully recognized by Rome. In the twentieth century there have been a variety of positions taken by the various Eastern Orthodox Churches on the validity of Anglican orders. In 1922 the Patriarch of Constantinople recognized them as valid. He wrote, "That the orthodox theologians who have scientifically examined the question have almost unanimously come to the same conclusions and have declared themselves as accepting the validity of Anglican Orders." Succeeding judgments, however, have been more conflicting. The Orthodox Churches require a totality of common teaching in order to recognize orders and in this broader view finds ambiguities in Anglican teaching and practice problematic. Accordingly, in practice Anglican clergy who convert to Orthodoxy are treated as if they had not been ordained and must be ordained in the Orthodox Church as would any lay person. In the Roman Catholic Church, Pope Leo XIII stated in his 1896 bull Apostolicae Curae that the Catholic Church believes specifically that the Anglican Church's consecrations are "absolutely invalid and utterly void" because of changes made to the rite of consecration under Edward VI, thus denying that Anglicans participate in the apostolic succession. "For if the Pope shall by a new decree declare our Fathers of two hundred and fifty years ago wrongly ordained, there is nothing to hinder the inevitable sentence that by the same law all who have been similarly ordained have received no orders. And if our Fathers, who used in 1550 and 1552 forms which as he (the Pope) says are null, were altogether unable to reform them in 1662, (Roman) Fathers come under the self-same law. And if Hippolytus and Victor and Leo and Gelasius and Gregory have some of them said too little in their rites about the priesthood and the high priesthood, and nothing about the power of offering the sacrifice of the Body and Blood of Christ, the church of Rome herself has an invalid priesthood…"
Lutheran Churches: Evangelical Lutheran Church of Iceland, Church of Norway, Church of Sweden, Evangelical Lutheran Church of Finland, Estonian Evangelical Lutheran Church, Evangelical Lutheran Church of Lithuania; observers: Church of Denmark, Evangelical Lutheran Church of Latvia. Anglican Communion: Church of Ireland, Scottish Episcopal Church, Church of England, the Church in Wales, as well as the Lusitanian Catholic Apostolic Evangelical Church, and the Spanish Reformed Episcopal Church. The six major Lutheran Churches of the Porvoo Communion (those of Iceland, Norway, Sweden, Finland, Estonia, and Lithuania) believe that they ordain their bishops in the apostolic succession in lines from the original Apostles. Two other Lutheran Churches (those of Denmark and of Latvia) were observers at Porvoo. Several Churches within the historic episcopate believe the Church of Sweden and the Evangelical Lutheran Church of Finland  have maintained apostolic succession, despite their Lutheranism. This view is not held by the Roman Catholic Church nor by all of Orthodoxy. In other words, Methodists understand apostolic succession as being rooted within the Presbyterate. This does not mean, however, that all elders may ordain; quite the contrary: only those elders who have been elected and consecrated as bishops can further the apostolic succession through the ordination of bishops, elders, and deacons within the United Methodist Church. In this way, the United Methodist episcopacy functions as if it were within the historic episcopate. Wesley never actually denied being consecrated a bishop, what he denied was requesting consecration from Erasmus. Contrary to the "Erasmian consecration" stands the undeniable fact that, beginning with the American Revolution in the 1770s, Wesley did request episcopal consecration for several of his preachers and, indeed, for himself, so as to provide sacramental ministry for the Methodists in the break-away colonies. Opponents of the possibility that John Wesley had been consecrated a bishop by Erasmus of Arcadia argue that if Wesley had already been consecrated a bishop by Erasmus, he would have not requested such consecrations for others or for himself. The Greek Orthodox Bishop, Erasmus of Arcadia, is said to have ordained several Methodist lay preachers during Reverend John Wesley's absence from London in 1764,notably, Reverend John Jones. Nevertheless, the "Erasmian consecration" remained a very popular argument throughout much of the 1800s and, while still garnering a following among some proponents today, it is not accepted by a majority of Methodists nor even by most of those who affirm a form of Apostolicity for their bishops. Interestingly enough, Wesley's consecration as a bishop by Erasmus of Arcadia is affirmed by Unity Catholic Church, an Independent Catholic Church. Many Protestant Churches, especially those following the Magisterial reformers (e.g., John Calvin) (1509-1564), deny that the apostolicity of the Church rests on an unbroken episcopacy. In general, while Protestant Churches seldom refer to traditional post-Apostolic (ante-Nicene) doctrine, they will accept such claims advanced by the ancient Churches, as supportive evidence for their (Protestant) understanding of Scripture. Among the non-Calvinistic (Reformed) Protestant Churches, e.g., most of those following Martin Luther (1483-1546), many are, to a degree, similar; nonetheless, some Lutheran Churches claim for their bishops the ecclesiastic authority of traditional Apostolic Succession (see "Lutheran Churches"). Of course, the more moderate "Protestant" Churches claim such traditional authority as well, but with some redefinition of the terms used. Most Protestant Churches would deny that the apostolicity of the Church rests on an unbroken episcopacy. To share with the apostles the same faith, to believe their word as found in the Scriptures, to receive the same Holy Spirit, is the only sense in which apostolic succession is meaningful. Many Protestants point to the fact that when leadership in the Bible became disobedient or strayed from his command, God would then bestow that position upon an individual who was more obedient to his will regardless of any claim that any other person would have through tradition. An example of this would be when King Saul of Israel was removed by God due to his disobedience so that King David could assume the throne. Protestants see apostolic succession in much the same way. In the view of many Protestants apostolic succession is not a matter of tradition, rather it is a matter of God safe-guarding his church by means of bestowing authority to those whom best exemplify sound doctrine. ↑ The Prescription against Heretics: Chapter 32 Retrieved August 18, 2008. ↑ For example, the unbrokenness of apostolic succession may be significant because of the promise made by Jesus Christ that the "gates of hell" (Matthew 16:18) would not prevail against the Church, and his promise that he himself would be with the apostles to "the end of the age" (Matthew 28:20). According to this interpretation, a complete disruption or end of such apostolic succession would mean that these promises were not kept; as would an apostolic succession which, while formally intact, completely abandoned the teachings of the apostles and their immediate successors, for example, if all the bishops of the world agreed to abrogate the Nicene Creed or to repudiate the Bible. ↑ The Nicene Creed (325 C.E.). ↑ Thomas O'Reilly, Catholic Encyclopedia: Apostolicity The Catholic Encyclopedia, 1907 ed. newadvent.org. Retrieved August 18, 2008. ↑ Timothy Dufort, The Tablet (Roman Catholic Diocese of Brooklyn), May 29, 1982, 536–538. ↑ from the Oecumenical Patriarch to the Presidents of the Particular Eastern Orthodox Churches, 1922, The Ecumenical Patriarch on Anglican Orders Retrieved August 18, 2008. ↑ The Orthodox Web Site for information about the faith, life and worship of the Orthodox Church Retrieved August 18, 2008. ↑ Saepius Officio: Answer of the Archbishops of Canterbury and York to the Bull Apostolicae Curae of H. H. Leo XIII Retrieved August 18, 2008. ↑ Archbishops of England: Saepius Officio: Answer of the Archbishops of Canterbury and York to the Bull Apostolicae Curae of H. H. Leo XIII Retrieved August 18, 2008. ↑ Introduction to the World of Autocephalous Churches in the Apostolic Succession. Retrieved August 18, 2008. ↑ Ind-Movement: Introduction to the World of Autocephalous Churches in the Apostolic Succession Retrieved August 18, 2008. ↑ Joseph Wilhelm, Catholic Encyclopedia: Apostolic Succession The Catholic Encyclopedia, 1907. newadvent.org. Retrieved August 18, 2008. ↑ The Reverend Dr. Gregory S. Neal, Grace Incarnate Ministries: Methodist/Anglican Thoughts On Apostolic Succession Retrieved August 18, 2008. ↑ Wesley Center Online: The Methodist Quarterly Review 1878 Retrieved August 18, 2008. ↑ Hans Rollman: Early Methodism in Newfoundland Retrieved August 18, 2008. ↑ . The Methodist Archives Biograpical Index: "Erasmus" (from Encyclopedia of World Methodism, 1974). Retrieved August 18, 2008. ↑ Unity Catholic Church: Constitution.unitycatholic.org. Retrieved August 18, 2008. This page was last modified on 21 November 2008, at 13:39.